The field of dentistry has changed tremendously over the past 50 years. Because the science was once poorly understood, emphasis was put on treating the disease rather than knowing how to prevent it. In other words, if you got a cavity, you went to the dentist to get a filling. Or you would wait until you had pain before you saw a dentist. What ended up happening was that the disease controlled us, and not the other way around. Today, the emphasis is preventing the disease before it happens. Children in elementary schools are learning early on how to brush and why it's important. Advancements have been made in dental biology; we now understand more about what causes tooth decay and gum disease, and even how our saliva can help with diagnosis of genetic or health problems. Advancements have also been made in the development of tools to prevent problems. Comprehensive Exam: The goal is to find potential problems early so treatment is as simple as possible and less costly. This includes looking at the teeth, gums, bones, and the rest of the mouth. Our dentists will evaluate all existing work done to make sure any bridges, crowns, fillings, or implants are all intact. No topic is left unanswered, so if it's snoring problems or bad breath that's bothering you, our dentists will listen and provide solutions. We have a team of specialists who provide their expertise whenever it's needed. Pretty Smile Dental is truly the multi-specialty dental group. Digital X-rays: Quick, environmentally friendly, and with 90% less radiation exposure than conventional X-rays, digital radiographs are more accurate and clearer than processed films. Dentists can also easily email the x-rays to each other for better communication. Cleanings: The cells in your mouth are the same type as the cells that make up the surface of your skin. So imagine if you get a cut on your hand and it gets infected. The area becomes red and swollen, hurts when you touch it, and may bleed. The same thing happens in the mouth when plaque is not cleaned properly. Plaque is soft and sticky and is made up of bacteria that cause cavities and gum disease. Calculus is hardened plaque and is an indication of poor hygiene. Your hygienist will give you detailed instructions on how to keep your mouth healthy after your cleaning. Since education is the key, we're happy to give you tips and reminders any time you come in. Sealants: Placed for children and teenagers on the chewing surface of the adult back teeth, sealants are clear plastic coatings that help prevent cavities. No injections needed! Night Guard: For those that have a history of grinding or clenching that can cause them to wake up with sore jaw muscles and headaches, night guards are a preventive, comfortable, removable appliance that acts as a splint to protect the jaw joint. The concept is similar to a knee splint for a runner who doesn't want to overwork his knee joint. It is worn either on the top or bottom arch and shields the teeth from scraping against each other. Most people who grind their teeth at night are not aware that they do it , it's usually a significant other who hears the grinding going on. A dental professional will be able to tell you for sure by looking at the evidence inside the mouth. If needed, impressions are taken and a customized night guard is made. And don't worry: night guards look and feel nothing like those bulky mouth guards football players and basketball players wear. Over 100 species of bacteria, fungi, and viruses take up residence in our mouths. Saliva contains 40 essential proteins. 50% of Americans do not receive regular oral health care. The average person only brushes for 45 to 70 seconds per day. The recommended amount of time is 2 minutes, twice a day. It is possible to have periodontal (gum) disease with no warning signs or pain. The hygienist's role goes beyond just a professional cleaning. 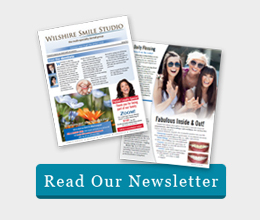 Our hygienists are trained and licensed to deliver a wide range of services to our patients. These may include periodontal therapy (deep cleanings), periodontal screening and risk assessment, periodontal maintenance, home care guidance and instruction, nutritional counseling. Tongue cleaning is becoming more broadly recognized and recommended by dental professionals as an essential step for proper oral hygiene. As bad breath concerns have become a focus, the tongue has been recognized as a source that harbors a large percentage of the bacteria in the mouth, even after brushing and flossing. Studies indicate that although brushing the tongue is an effective way to remove the bacteria, using a tongue cleaner/scraper with a specially designed shape that conforms to the surface of the tongue and has a ripple edge is the most effective means for cleaning the tongue.